On august 31st, we celebrated our wedding in Rotterdam surrounded by family and friends. 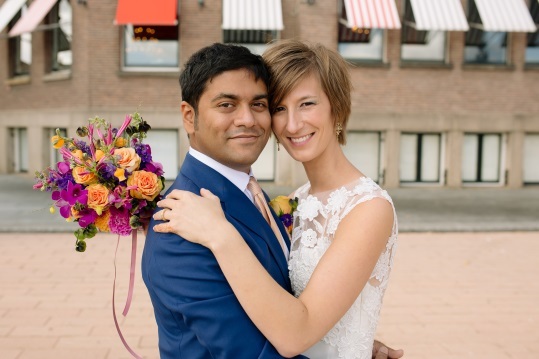 As a Belgian bride, a Bengali groom and guests from all over the world, we chose to have our ceremony in English. Grietje was able to create a ceremony that was unique, lively and crossed all language and cultural boundaries. So many guests told us they enjoyed the ceremony, and we wholeheartedly agree. Because of the time and attention spent in the preparation process, it really felt Grietje knew us and knew our story. Her enthusiasm and kindness were an added bonus!